Indulge awe-inspiring views of some of the most iconic landmarks in the state by embarking upon once of these amazing helicopter rides in NY. Enjoy the most spectacular helicopter tours New York has to offer. 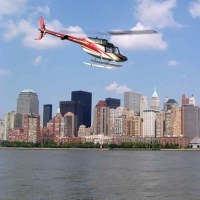 See our complete list of NY helicopter tours. Fly around NY's Most Renowned Skyscrapers! Serving New York visitors since 2006, Manhattan Helicopters is bound to give you a truly dramatic and unforgettable sightseeing experience around the city's most renowned skyscrapers. Whether you're a first-time visitor or a local seeking new adventures, the New York helicopter tours are guaranteed to amuse and excite you. The company's friendly and experienced pilots will always make you feel like a VIP. The modern helicopters feature comfortable seats and custom-size large windows that are perfect for picture-taking. If you need to communicate with your pilot, the aircrafts are equipped with state-of-the-art Bose headsets with voice-activated microphones. Amazing Helicopter Tours in NY! Enjoy amazing sky tours of New York City and Long Island with the Metro Limousine Sky Tour Service! All sky tour packages include transportation in one of the company's luxurious stretched limos. All vehicles come fully stocked with a bar (complete with soda and juices), air conditioning/heat, music, and TV's. Choose from one of two flight packages. The first NY helicopter tour, Apples in the Sky, allows you to view such breathtaking sights as the Statue of Liberty, the World Financial Center, the Empire State Building, the Chrysler Building, Ellis Island, and other memorable landmarks. The second package, the Ultimate NY Tour, will grant you virtually every possible view of NYC. Both flight packages accommodate two passengers, though you can book additional passengers for an added fee. 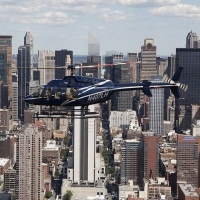 Fun, Safe Helicopter Tours in New York! The sky's the limit at East End Helicopters in New York! 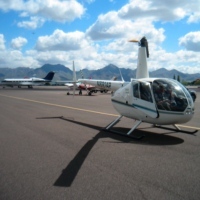 The locally owned and operated company utilizes affordable and well-maintained helicopters; all of which are flown by skilled, experienced, professional commercial pilots. Even if you've never flown in a helicopter before, the first-class pilots and crew will ensure your comfort and safety. Keep your camera handy as you behold some of New York's most unforgettable sights! If you're interested in booking one of the most amazing helicopter tours New York has to offer, the reservation form is available on the website. Reservations must be made at least 72 hours in advance, especially for groups of four or more. Book all Sorts of Cool NY Helicopter Tours! For helicopter rides in New York, choose the largest and most experienced helicopter sightseeing and charter service in the Northeast! 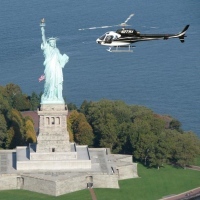 Offering one-of-a-kind sightseeing opportunities since 1990, Liberty Helicopters is known for its flawless safety records and stringent commitment to customer service. The company features a variety of standard tours and special packages, to fit your budgetary needs. Whether you're looking to indulge the most spectacular sights of the city or tie the knot from thousands of feet in the air, Liberty will provide you with the ultimate aerial experience. Flight's take off from NY's Downtown Manhattan Heliport, which is conveniently located near several mass transit stops. View New York's Great Attractions! Committed to providing safe, efficient, and convenient transportation services; New York Helicopter is led by FAA-certified pilots who will ensure the safest and most enjoyable flight experience for all their guests. The pilots know the state of NY like nobody else and will guide you through the most visually striking areas of the region. 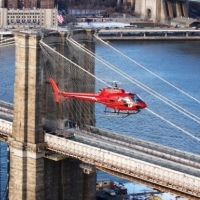 Choose from an array of New York helicopter tours. 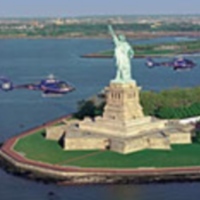 With the 15-minute Liberty Tour; you can view such attractions as the Statue of Liberty, Ellis Island, the South Street Seaport, and the Brooklyn and Manhattan Bridges. Or view NY's most famous park, along with other great sights, by signing up for the 19-minute Central Park Tour. For the ultimate experience, take the 25-minute Grand Tour in which you'll also get to fly over Yankee Stadium and Battery Park! Tours book quickly, so book your reservation as soon as possible! Topnotch Helicopter Rides in New York! Be prepared for an unforgettable adventure with Helicopter Flight Services, Inc.! Cherish a bird's eye view of Manhattan as you indulge such sights as the Chrysler Building, the Empire State Building, the Statue of Liberty, Ellis Island, and the South Street Seaport. Reservations are highly recommended. If you're looking for a quick, easy, and comfortable alternative to traveling in the NY area; the company also offers helicopter charters. All helicopters are equipped with heating and air-conditioning, as well as a Bose stereo system, so you are bound to enjoy your ride. 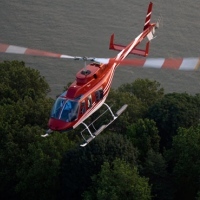 The fleet consists of five Bell 407 helicopters that are proven to be safe, fast, and powerful. All-Purpose Helicopter Rides in NY! Offering valuable personal and business helicopter service in NY, H&L Enterprises will reward you with picturesque views of Chautauqua Lake and surrounding areas. The company's pilots have the technical knowledge, expertise, and qualifications to ensure a safe and convenient flight. Plus, all flights are available for fair, competitive rates! The 4-seat Robinson R44 Helicopter is known for its first-rate, commercial-grade performance; as well as executive-class comfort and beautifully panoramic visibility. Choose a tour package tour and customize a flight to meet your needs. Other services include aerial photography, ferry flights, time building, and aerial surveys. 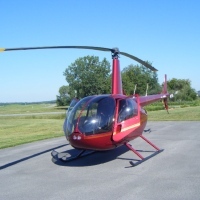 Fast, Efficient Helicopter Charters in NY! Providing on-demand helicopter charter service in NY, Raven Helicopter is perfect for executives looking for a fast and efficient way to fly from Hancock Airport to its surrounding areas. The New York helicopter charters have been gracing the skies for over 10 years. All flights can be customized to fit your needs. During the NY helicopter tours you can explore such attractions as Onondaga Lake, Oneida Lake, Lake Ontario, The Finger Lakes' wine country and lakes, and Tug Hill. Your R66 helicopter can seat up to 4 passengers. The helicopter charters are also great for marriage proposals, birthdays, and proms.